Below we have included several commonly asked questions that we hear at Eastern Shore Porch & Patio regarding our products and service. If you still have any questions that are not addressed here, feel free to call us at 302-436-9520 or email us at info@esvinylproducts.com and we will be happy to assist you. Virgin vinyl is just vinyl that has never been processed. Some extruders use what is called “regrinds” which is bits of vinyl from older extrusions. How do I clean my fence or rail? A good power washing works great! You will not hurt it. We sell products that you can use to pretreat so the job goes much smoother and faster. Do you sell just parts? Yes! Unlike the box stores, we will sell just the parts you need. What is the warranty on my Eze-Breeze windows? There is a lifetime warranty on the frames and a 10-year warranty on the vinyl, providing that you use the PGT cleaner and preservative twice a year. How do I clean my Eze-Breeze windows? You do not have to use the PGT cleaner every time you clean them! Simply use a ¼ cup of Murphy’s Oil Soap or Woolite added to a gallon of warm water. Get a mitten that you would use to clean a car and do one window (four panels) at a time. How long will it take to get my job fabricated? During the off-season, you can expect to get your rail job in three days and your fence job in seven days. When everyone is busy (March – September), expect rail jobs to take a week and fence jobs to take two weeks. Can I get my Eze-Breeze windows rerolled by you? Yes! We reroll all Eze-Breeze windows and do any repairs (latches, etc.) for about $20 per panel, depending on size. Yes! 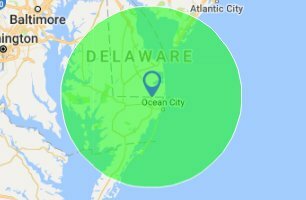 We will deliver within a 40-mile radius of Selbyville, DE. Cost will depend on size and distance. Orders over $2000 also get FREE delivery! Yes! All our installs are done through Eastern Shore Porch & Patio. Call us at 302-436-9520 to set up the installation.